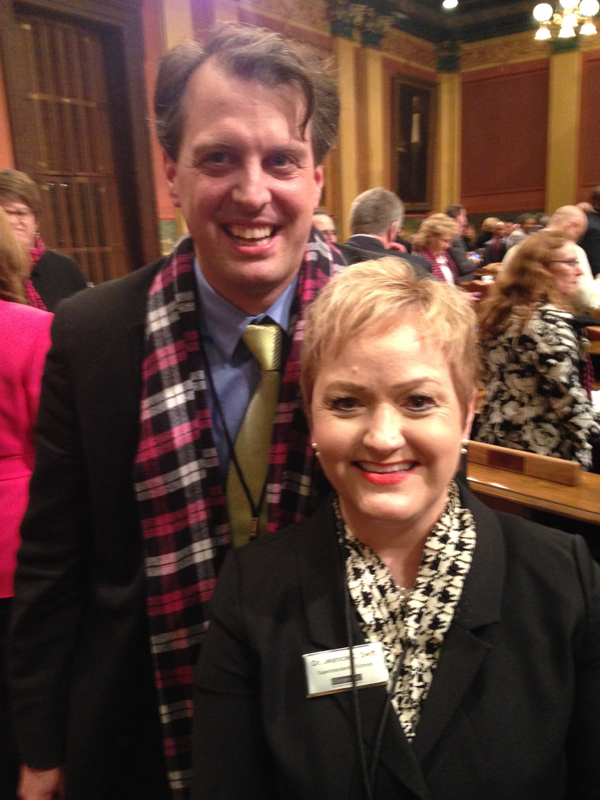 Rep. Jeff Irwin, D-Ann Arbor, with AAPS Superintendent Dr. Jeanice Swift. Photo provided by Dr. Swift. AAPS Superintendent Dr. Jeanice Swift attended Gov. Rick Snyder’s “State of the State” Thursday night as a guest of Rep. Jeff Irwin (D-Ann Arbor). “In the past three years we’ve invested $660 more per student than there was previously when I took office,” Gov. Snyder said early in his speech last night. The district’s per-pupil funding has continued to decrease. AAPS’ per-pupil funding in 2002 was $9,034; in 2013 it had decreased to $9,020. “As compared to back in 2002, our children have higher instances of living in poverty, speaking English as a second language and experiencing other at-risk factors,” Dr. Swift said. Dr. Swift also added that public schools are experiencing a “whole host of unfunded mandates” in the form of new required assessments, new literacy requirements and new online requirements. Dr. Swift was pleased with Gov. Snyder’s support of early childhood education. The legislature has invested $65 million to create 18,000 openings for preschool children, and the governor pledged another $65 million toward the same cause. Dr. Swift hopes that the nearly $1 billion surplus in the state’s budget is used in part to make up for the declining state support for public education. I am very pleased with your strong response to the Governor’s SOTS address. There is a groundswell of parent reaction to the imposition of standardized assessments and the Common Core. I hope your administration will take a stand against these measures, as we parents are doing, and speak out similarly in support of our fine teachers and against evaluation by scantron. This community values education, not corporate-imposed measurement and data collection. Again, thank you for your advocacy on behalf of our children in public schools. I would like to know whose decision is it to assign money to address structural issues with pensions vs go ‘to children’. Thank you for attending this event and being there in support of our district and the students as individuals. I agree, and I am a part of that groundswell.